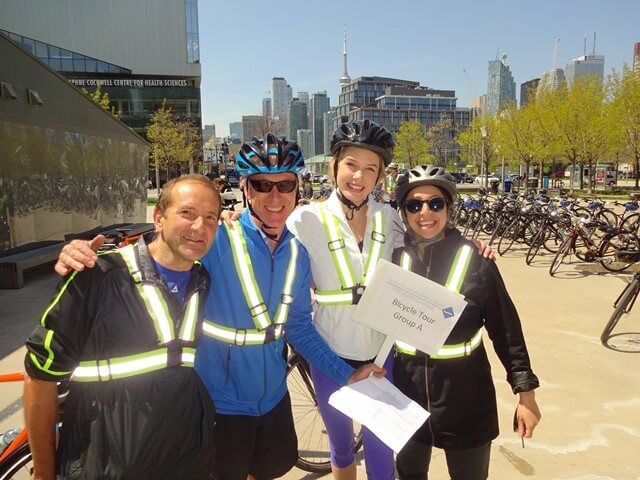 At Toronto Bicycle Tours we are the friendly guides to those exploring Toronto. Whether they are first time visitors, returning guests, or even long-time residents, we seek to connect our customers to the city, and to each other. Our love of meaningful experiences links us together, and encourages our guests to lose themselves in the story of Toronto, and in doing so, add their own unique experiences to the life of this great city. As one of our Bicycle Tour Guides, you will be an ambassador for the city. Often as the first point of real contact for new visitors from around the world, you will connect to people of all ages, in a way that is thoughtful and fun. You know how to tell stories with more than just flash and energy – you’re genuinely interested in people, and your stories create a connection, and encourage your guests to weave their own stories with yours. You will be directly responsible for the safety and enjoyment of your customers, so knowledge of safe riding practices and experience riding in Toronto is essential. You’ll lead our award winning rides, on and off the beaten path, from the most popular landmarks and tourist spots to Toronto’s hidden neighbourhoods, parks, and locales. Our guides come from a variety of backgrounds, but they all love the outdoors, live in (and love) Toronto, and are comfortable leading and entertaining groups. Maybe you’re a grad student who loves to talk about urban affairs, an actor who relishes the opportunity to tell a great story, a hospitality worker who loves taking care of customers, or just an avid cyclist who believes that the best way to get to know a city is on two wheels. Guides who work full-time will spend about 30% of their time in our office coordinating and supporting our tours. As a Guest Services Agent, you will be the first point of contact for people from around the world who are looking for the best way to spend their time while in Toronto. You will field their questions about our tours and rentals, make recommendations, help them with bookings and administer our bike rentals. You will also provide support to our tour operations, helping to ensure that everything goes smoothly and that our guests have a fantastic experience. Either way, if you are driven by your love of your city, and your desire to show others why Toronto is great, then we want to talk to you! Or if you know someone who’d consider this their dream job – do them a favor and pass it along! -> For full-time job: Great phone & email manner. Familiarity with web applications, email & instant messaging and social media. Our Tour Guides get to work outside, meet interesting people from all over the world, and have a ball exploring our great city. The part-time position is May-early October, with training (part-time) in April. Part-time contract is up to 22 hrs/week. The full-time position is May – early October (full-time), with training (part-time) in April. Full-time contract is ~35 hrs/week with 70% of time spent leading tours, and 30% in the office. All work is done in a set schedule with the possibility of mornings and/or afternoons and/or evenings. We realize people have other jobs and commitments and try to accommodate requested schedules for our guides. Pay is a competitive hourly wage with tips (you’ll see how much after the application). Our online application will give you the option to apply to this role as a complete candidate – not just a resume. The application will assess your qualifications, personality traits and workplace preferences, and should take 10 to 15 minutes to complete. You can get a copy of your assessment when you’re done by logging back into the application tool. We value diversity and inclusion and encourage all qualified people to apply. If we can make this easier through accommodation in the recruitment process, please contact us with the “Need Help” button in the application.